Pujya Deepakbhai visited Dharampur, on 13th December 2012. Pujyashri Gurudev heartily welcomed Pujya Deepakbhai. 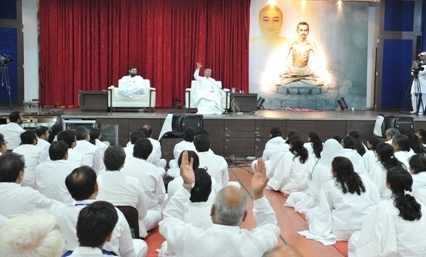 Pujya Deepakbhaiâ€™s spiritual discourse was organized by the followers of Pujyashri Gurudev. They asked questions about soul, god, self realization, celibacy etc. and they were impressed with the answers they received. Â The followers of Pujyashri Gurudev also received more insight into Akram Vignan Science and Dadaâ€™s Gnan.Â At the end of the event Pujyashri Gurudev and Pujya Deepakbhai gave a token of remembrance to each other. 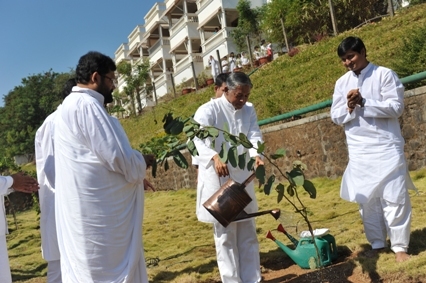 Then they honored Pujya Deepakbhai by asking him to plant a tree and also toured him around the city of Dharampur.